The resource drive will take place on April 27th. We need 2 or more people and shovels on site to unload compost and woody debris/mulch. Also, Syracuse Grows is looking for pickup truck drivers to help move material around and will pay for cleanup costs. The HQ for the Resource Drive will be on the corner of Colvin & Salina St.
Spring seedlings partnership with the Brady Farm was announced: member gardens will get a $20 credit to pickup seedlings at Brady Farm. 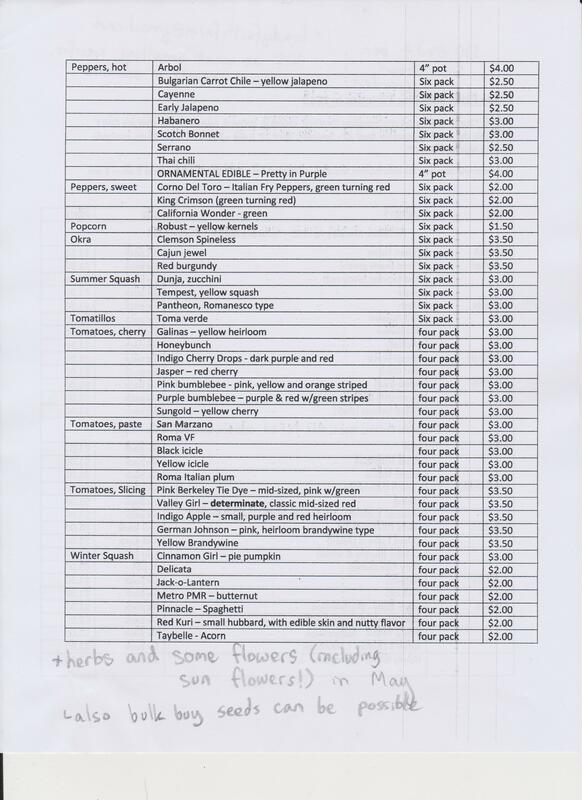 The images below link to the available seedlings list passed out at the meeting (front and back). 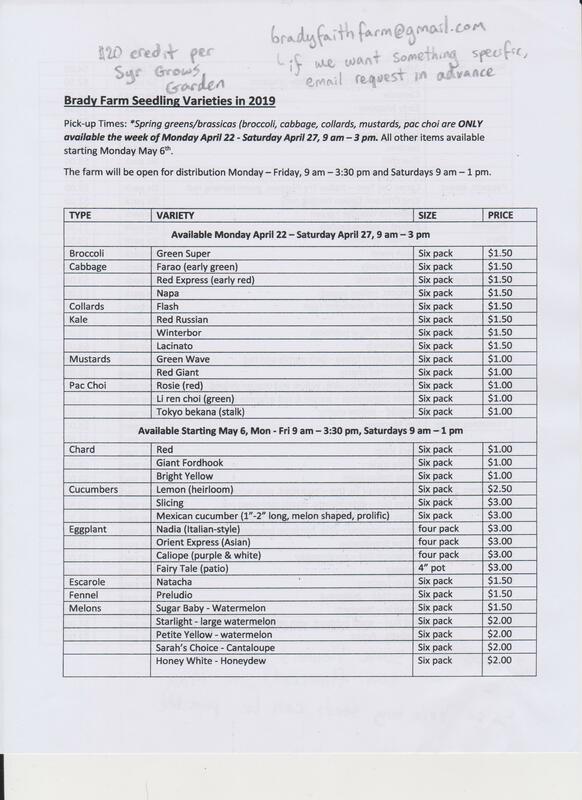 Most items will be available starting May 6th (farm is open Monday-Friday 9am-3:30pm and Saturday 9am-1pm). Spring greens/brassicas (broccoli, cabbage, collards, mustards, pac choi) are only available the week of April 22 – 27th, 9am-3pm. Syracuse Grows Mini-Grant Program for member gardens is available this year. Applications are short and just call for receipts and status updates if awarded. Awards are reimbursement-based with a maximum of $400 per garden. Applications are reviewed on a rolling basis at the 2nd Tuesday of each month. Other funding opportunities were discussed: the Parks Conservancy offers up to $2,000 grants and Syracuse community gardens within the city are eligible. The Gifford Foundation’s What If grant is another potential funding source, with rolling applications and a history of awards to community gardens. We announced the upcoming Plant Sale & Swap hosted by Alchemical Nursery & Bread and Roses.